Despite the men’s fears, David, after inquiring of the Lord and gaining God’s assurance that he would deliver the Philistines into his hands, goes to Keilah and saves it. Saul interprets this as God handing David over to him, so Saul goes to Keilah to besiege David. David asks God if he will be surrendered to Saul and God answers that he would be handed over by the people. David and 600 men flee Keilah and are on the move in the Desert of Ziph. God protects David from Saul who is looking for David. David rendezvous with Jonathan at Horesh who encourages David in his plight. This will be the last time they see each other. The Ziphites, a tribe near Horesh, offers to capture David for Saul. Saul tells them to track David and then he’ll go with them to find David. David continues to run and as Saul is closing in, God sends the Philistines to distract Saul who must abandon the search for David and go and fight instead. Simultaneously, David prays for God to save him, for God to vindicate him and destroy his enemies, and he sings God’s praises and expresses his faith in God to do all that he asks. 9) Part Personal Question. My answer: David always consulted God first. I’m not very good at asking God first. I usually make the decision and then ask God to bless it. This is definitely my prayer this week! 10) Personal Question. My answer: God provides and protects. He sends Jonathan to encourage, probably when David needed it most. I loved how God keeps Saul at bay and the best part is how he sends the Philistines to attack Israel to protect David! God uses Israel’s enemies in ways to save Israel! How cool is that! God also warns and counsels. He is so good if we would only just listen! We also see an example of how people interpret God’s actions wrongly as Saul thinks God is giving David to him when God is really saving Keilah. This is a warning to us both to be wary of people who say “God told me to” and for ourselves when we tell ourselves “God told me to”. Did He REALLY??? 11) Personal Question. My answer. Similar to #10 we just answered. I loved how God keeps Saul at bay and the best part is how he sends the Philistines to attack Israel to protect David! God uses Israel’s enemies in ways to save Israel! How cool is that! God encourages David through Jonathan, and, knowing Jonathan will die, allows David to see him one more time. This is a blessing to both men! David always stays one step ahead of Saul thanks to God. God’s hand touches all we do, all we say, all that happens to us and around us. I need to have faith more in Him, and let Him handle things His way, not mine. 12) Part personal Question. My answer: God is faithful; God is his help; God sustains him; God destroys his enemies; God has delivered David from all his troubles. All of these are comforting. God is the giver of life and is responsible for all my blessings. He is faithful. He sustains me in all aspects: physical, mental, emotional, spiritual. He delivers me from my troubles and takes care of my enemies. God is good! God is in control. Period. He works his magic behind the scenes to care for us, to protect us, to encourage us, to rid us of our troubles and our enemies, and to sustain us — all because He loves us. Undeserved love. If we would have faith like David, I think our lives would be much more content, calm, and peaceful as we trusted God in all that we do. The Israelites brought this plea for help to David and not to King Saul because Saul was not fulfilling his role as king over Israel. It was Saul’s job to protect Keliah and it was Saul’s job to fight the Philistines, but Saul wasn’t doing his job, so the Lord called David to do it. David consulted God first (did not pawn off the job on Saul, saying this isn’t my job). David had 400 men who were not trained and bad credit reports (1 Samuel 22:2). David had enough trouble with Saul and he didn’t need to add trouble from the Philistines – one enemy is usually enough. Saving Keilah would expose David to Saul. This was a dangerous course of action. Why did David save Keilah? God confirms His word (He does this frequently for us and for those in the Bible) AND adds a promise — something He does for us as well. Saul assumed because David was his enemy that David is God’s enemy. The opposite is true. God’s enemies are ours. David seeks God again, this time through the priest using the Urim and Thummim. Notice how the questions are presented in a “Yes or No” format, because that is how the Urim and Thummim were used. David could have stayed and fought, and maybe there was something in him that wanted to. But David knew it was not the Lord’s will, and maybe a lot of innocent people would get hurt. So, David, who was a great warrior, humbled himself and escaped. David was not the kind of man to sneak away from a battle, but he didn’t let his pride get the best of him in this matter. Ziph was a town below the southern tip of the Dead Sea with a dramatically varied landscape. It was not a comfortable or easy place to be — it was a desert. God guided and protected David, but it wasn’t comfortable or easy. This was an essential time for God’s work in David’s life. He became a man after God’s heart in the shepherd’s field, but he became a king in the wilderness. Many of us walk through our own deserts, and God is there, at work in our lives, too. Saul was a determined enemy, unrelenting in his pursuit of David. Saul was so obsessed with killing David that he didn’t give attention to the work God called him to do. Man can intend, attempt, and work all kinds of evil but God is still in charge. Led by God, Jonathan encouraged David. Jonathan’s encouragement was a mix of divine promises and an expression of hope, desire, and love. Saul was so spiritually warped that he said the betrayers of an innocent man were blessed. He believed it was David who was crafty when it was God protecting David the entire time. 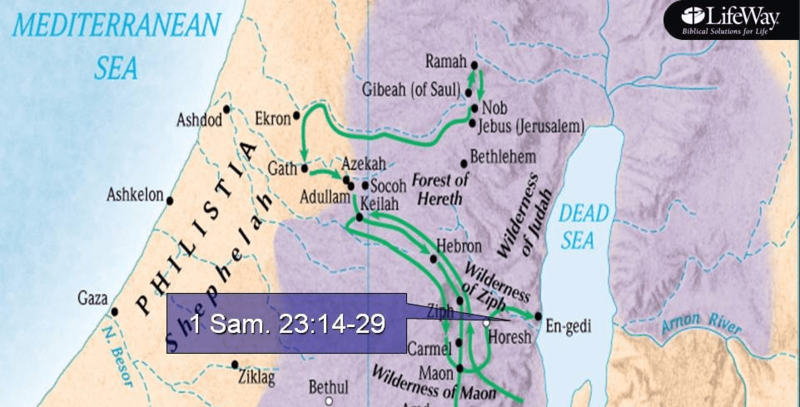 There were actually two times the Ziphites betrayed David to King Saul: 1) in 1 Samuel 23 and 2) in 1 Samuel 26. David escaped both times, but the circumstances of this Psalm seem to best fit the circumstances of 1 Samuel 23, when David learned of the Ziphite betrayal but before God delivered (1 Samuel 23:26-29). This is one of the few Psalms with a specific musical direction: with stringed instruments. It is also called A Contemplation. The Hebrew word for Contemplation (maskil) might be better understood as instruction. David relied on both the name and the strength of God. God’s name speaks of the nature and character of God; strength (or might) of His great power. David’s rescue would be his vindication. His enemies would have greater evidence that David was in the right and they were in the wrong when God saved him. Shortly after both times the Ziphites betrayed David, David had the opportunity to kill King Saul. Both times he spared Saul’s life (1 Samuel 24 and 26), and both times Saul admitted he was wrong. It was common for David and others in their prayers to merely ask for God to hear or give ear to their cry. It was assumed that if God heard, He would act. The Ziphites were Israelis; they were even of the same tribe as David (Judah). Yet their betrayal of David was so contrary to both David and God’s cause that David could rightly refer to them as strangers who sought David’s life. Who do you know today who does this same thing? The Ziphites rejected God as well as David. David’s troubles did not lead him to question the goodness of God, but, instead, to appeal to it. God’s truth (or faithfulness) was under attack as well. Destroy does mean death–dealing blow. Should you pray for your enemies to be destroyed? Some are uncomfortable with prayers that ask for the doom of enemies. It’s true that Jesus told us to pray in a more generous way for our enemies (Matthew 5:43-44). Yet there is nothing wrong with the basic principle of wanting to see good triumph and for God to do His work against those who do evil — to render the judgment and consequences that comes with evil and disobeying God. Should you destroy your enemies? David refused to take vengeance in his own hands. Immediately after the second betrayal of the Ziphites (1 Samuel 26:1) David had the opportunity to kill King Saul in his sleep, and he refused. David waited on God to do it. A freewill offering is one that is given to God without a specific reference to a previously made vow. There was no requirement to do so. Note David praised God during his troubles and before his prayer was answered. So should we. How often do you thank God ahead of time? God’s past faithfulness became the ground for future faith. David knew what it was like to defeat his enemies (Goliath is an example); he trusted that he would know it again. Is Psalm 54 a Messianic Psalm? Jesus was the anointed King yet to come into the fullness of His kingdom. Jesus came to rescue and lead God’s people, and when He did, some among God’s people betrayed Him. Some of these lines from the Psalm could have been spoken by Jesus to His Father.